Down on Beale and more: new writings from Corey Mesler. A one-stop, one-night-only signing and reading "extravaganza" is how it's described, and extravaganza it is if you add in the fact that the evening is devoted to one author and the five books he's had published this year alone. 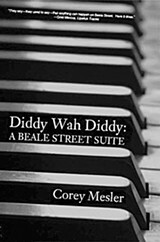 The author is Memphian Corey Mesler. The event is Thursday, November 7th. The place is Burke's Book Store, which Mesler co-owns with his wife, Cheryl. And the books? Mitmensch (Folded Word Press) is a stage-worthy trio of voices reminiscent of Samuel Beckett. My Father Is Still Dying (Flutter Press) is a moving collection of poems dedicated to Al Mesler, who died in 2001. The Travels of Cocoa Poem Lorry (Leaf Garden Press) is a short story in the form of a fictional sea captain's log. Our Locust Years (Unbound Content) is another collection of poems, 95 in number. 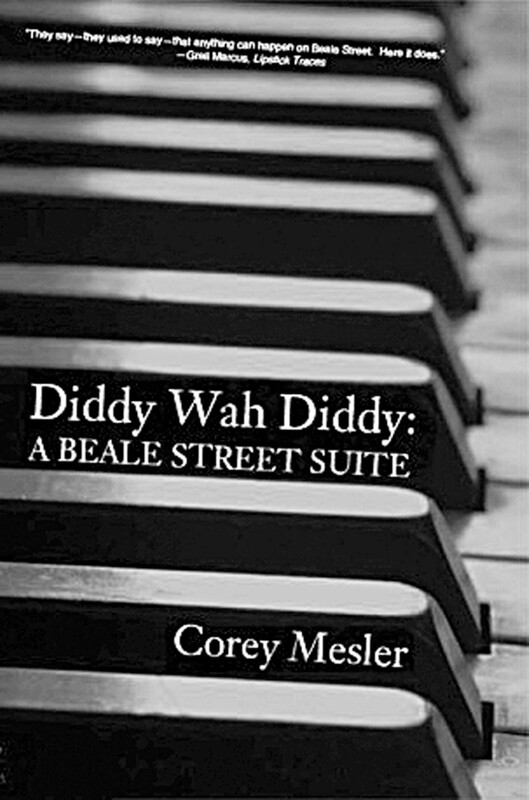 And the down and dirty and fantastical Diddy-Wah-Diddy: A Beale Street Suite (Ampersand Books) is a "collage novel" about the famed street and its denizens over the decades (with illustrations by Amy Crook). A new title that Mesler won't be signing — but has high hopes for — is Memphis Movie (Aqueous Books), which isn't due out until 2015. Find more on it below in Mesler's recent email Q&A with the Flyer. Begin, though, not with his books but with a short story by Mesler on what it means to be a man. It's part of an invitation-only online anthology of short stories written by 100 writers on a very short deadline, all using the same title, "How To Be a Man," Mesler says of the project organized by Narrative magazine in partnership with Esquire magazine. "In other words, a worldwide, simultaneous, creative synchronicity," he adds. Check out Mesler's story — which concerns a guy named Carp ("a reader: he lived in books") with underwater dreams, Carp's psychotherapist (who urges his patient to get out more), and Carp's father (who commanded his son to do the same: "Put the goddamn books down and go outside") — at narrative4.com. Mesler's in good company here. Other writers in the ongoing Narrative project (which costs readers a one-time fee of $5 for unlimited access) include Amy Bloom, James Lee Burke, Michael Cunningham, Edna O'Brien, and Salman Rushdie. Mesler, by email, has been in the company of a well-known actor too. Only the correspondence concerned Memphis Movie, not manhood. The Flyer: What's this about you and Peter Coyote? And Brad Pitt and Sean Penn? Corey Mesler: Memphis Movie comes out in early 2015, and the story concerns a director from Memphis who hits it big in Hollywood and then, after a few flops, can't get work. His one chance at redemption comes in the form of an independent feature to be filmed in Memphis. But my personal Hollywood dreams have died on the vine (or perhaps on the corner of Hollywood and Vine). The manuscript of Memphis Movie made it to Brad Pitt and maybe Sean Penn, but, oddly enough, neither called me. At least I count Peter as a friend now, and that is sweet. He blurbed the novel, as did Ann Beattie, actor and former Memphian Chris Ellis, William Hjortsberg (who wrote the novel on which the movie Angel Heart was based), local writer Cary Holladay, and actor and author Stephen Tobolowsky. You call Diddy-Wah-Diddy a "collage novel" and have hopes it could be the book that puts you on the literary map. The collage idea is about attacking a subject from diverse directions (poetry, prose, drama, drawings, songs, tomfoolery), the subject here being Beale Street, the physical place and the mythical. The book wiggles like a glowworm and dances like a spinning top. Donald Barthelme said, "Collage is the art form of the 20th century." I wish I knew what he meant. I think the literary map I will land on is the same one that features Lemuria and Oz and says, "Beyond here monsters." You'll also be signing two volumes of poetry on Thursday. Are you more at home with poetry or with prose? I used to write nothing but poetry. Bad poetry. Then I read Raymond Carver, and I thought maybe, just maybe, I could fashion a brief short story. Later, after I reached middle age, I thought, what the hell, why not try a novel? When I was a young pup, [Memphis journalist and writer] Fredric Koeppel told me he was working on a novel (which I am still waiting for), and I thought that sounded like just about the best thing a human being could try to do — better than walking on the moon or kissing Julie Delpy on the lips. Now I am happiest when working on the "marathon" rather than the "sprint." I still write a lot of poetry, mostly on days when my novel has become that gray thing that squats by the door. And given what a prolific writer you are, what's the going rate of rejection from publishers? About the same rate, which is poor enough to curdle reveries of triumph. Some rejections are fatuous, and some are just. Most I shrug off. But occasionally they hurt like a root canal. My skin, though roughened and coarse in many places, is still thin where it counts. The blurbs you've been getting generally: How's it feel to receive such good word from such a great company of writers: Greil Marcus, Bobbie Ann Mason, Steve Stern, and Richard Tillinghast? I'm grateful to all the authors who have helped me on my little journey. Sometimes I get to sit at the adult table. There really is a community of writers, and it can be quite encouraging. I never thought I would even write a novel, much less publish one, so, on days when I don't feel like an ugly dog shaved by a drunken barber, I feel truly lucky. The "One-Stop, One-Night-Only Corey Mesler Signing and Reading Extravaganza," Burke's Book Store, Thursday, November 7th, 5:30-7 p.m. Reading at 6 p.m. For more information, call Burke's at 278-7484 or go to burkesbooks.com. Follow the author at coreymesler.wordpress.com. Talking to the Tillinghast brothers.